One of 2019’s first major losses comes in the form of popular rapper and singer Post Malone, best known for his chart-topping songs and terrible stench, who has apparently transcended the realm of mortals after taking his first shower. “I never thought this would happen, dude,” lamented Burt McDover, who looked after Post Malone’s head lice. “Posty said he just wanted to try taking a quick shower because all his buddies did it every day. It’s the newest trend, you know? Then this weird light started coming from the bathroom and when I went to check it out, Posty was gone! I’ll never see my babies again,” McDover added mournfully, presumably referring to the head lice he had become quite fond of. 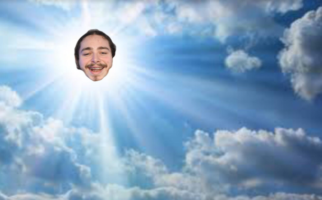 This theory was seemingly confirmed after residents of Grapevine, Texas – Post Malone’s hometown – heard celestial screams of “Not this song again!” in the sky amid the faintly echoing notes of “Psycho”.